This morning I set out to conquer Quandary Peak, my third fourteener in my life and in the last three weeks. I love the challenge despite getting a migraine after hiking each one…it’s about the only thing worth a self-inflicted headache…and maybe a good soccer game. My friend Cat lent me a couch to sleep on in Keystone Friday night, so that I could acclimate slightly to the altitude and so that I could shorten my drive to the trailhead in Breckenridge. I only had to get up at 4:45 am to meet my friend Karla, her daughter Kelsi, and Kelsi’s boyfriend Steven at the base of the peak by 6! Coming from Denver, they had a longer commute…I’m scared to know what time they got up. I’m not sure that is how I would have wanted to celebrate my 19th birthday, but more power to Kelsi, and HAPPY HAPPY BIRTHDAY!! As the sky lightened, we lathered our faces in sunscreen; strapped on our backpacks filled with extra layers of clothing, water, the ten essentials, and snacks; and made our way to the trailhead along with a few other eager hikers. As with many fourteeners, there were several routes that led to the summit. We chose the East Ridge which is rated a Class 1. The route, which begins at 10,850 feet, is a 6.75 mile roundtrip. The elevation gain to the 14,265 foot summit in less than 3.5 miles represents a 19% grade. The trail started off relatively steep immediately as we followed it through the pine forest. We spent the first mile or more in the tree line before we crossed through a slope of wildflowers. While the wildflowers were pretty, it was evident the flowers were at their finest a few weeks ago. The open expanse provided a lovely view down to the blue lakes below, as we began climbing up a now rocky trail. My friend Kelley, who hiked Quandary last week, had mentioned the trail was rocky. She wasn’t kidding. The rest of the way to the summit, the trail though well maintained, was rocky from the size of garden rocks to boulders. As we carried on, stopping occasionally to take in the view of the surrounding peaks, a hiker who had already summitted and noticed the giant lens hanging around my neck mentioned he had seen some mountain goats up ahead. Naturally, we had hoped they would stick around, though there were several people ahead of us, so we crossed our swollen fingers. We rounded another switchback and there they were, at the top of the trail ahead of us. Only one guy was in between us and the goats. He had moved off the trail. So did we. I had been bringing up the rear of our foursome all morning, so as I drew the camera to my face all I could feel was it moving around while I was huffing and puffing. On the landscape setting, I knew I was capturing some nice blurred shots as the camera moved up and down with my heaving, but I wanted to make sure I got a few images in case they got spooked. Lucky for me, they started heading down the trail directly toward us, looking at us curiously. It gave me time to switch the settings on my camera, to catch my breath, and to snap some clear photos of the mama and baby until two girls came barreling up with their music playing trying to get a close up shot. They frightened the poor goats off the trail and down the ledge where they laid down in the grass! That was quite disappointing…the goats were coming right by us!! We continued up, yes that was about the only option thus far, while the trail got a bit rockier though only once or twice did we ever need our hands to get over a rock. It really never required bouldering, even at the summit, and the trail was always well defined. We finally reached a flat area, 1,000 feet from the summit where most everyone stopped to rest, eat a snack, and enjoy an amazing view! Looking up toward the summit, all I could see was a rocky trail between two faces of the mountain that appeared quite ominous. My reaction was simply, “Oh My”. For most of this portion of the climb, it was much easier than it looked…which was a relief! Because eventhough it was easier than expected it still didn’t change how slow my legs were moving at this altitude. It never ceases to amaze how thin air affects the brain and body. Mentally, I focused on moving forward, telling myself to take another step. My leg seemed like it was in a delayed reaction…like it was pulling a heavy weight, but it wasn’t particularly tired. In the meantime, my heart was beating a mile a minute, despite the fact I was hardly moving. Once I neared the top, however, no matter how much my body wanted to stop, I refused. It must be the adrenaline or the intense desire to finish and eat my sandwich! Steven rocked it up the last part of the trail and left us girls behind. My first question to him when I summitted fifteen minutes later was “Aren’t you cold, now that you’ve waited so long?” Two minutes later, Kelsi asked the same thing! It was a glorious day to be on the top of a 14,000 foot peak. There was hardly a breeze or a cloud in the sky. Kelsi got to open her birthday card, which was giant, so she could hold it up like a sign and eat her cupcake. Karla didn’t bring a candle because she thought it would be windy…who knew we probably have gotten it lit! A fellow hiker left their sign up on the summit from the previous day, so we used it for our picture. We also signed the official log. This was a first for me. At Yale we couldn’t find the container and at Bierstadt the log was missing from the container. My hand hardly worked as I signed my name. I felt like a third grader writing out my name slowly and in much bigger letters than normal. We probably spent a good thirty minutes on the summit, eating, taking pictures for other hikers as they did the same for us, singing happy birthday, and just enjoying the surrounding peaks and alpine lakes peppering the green slopes below. On our hike down, we visited the mountain goats again while maneuvering the much more crowded trail. I wanted to reach out and help those white goats finish shedding! Remnants of their coats clinged to rocks and trees that lined the trail, yet clumps of hair still hung all over their bodies. Given the summer is almost over, it seemed if anything, they should be growing a new coat, not still shedding the old. 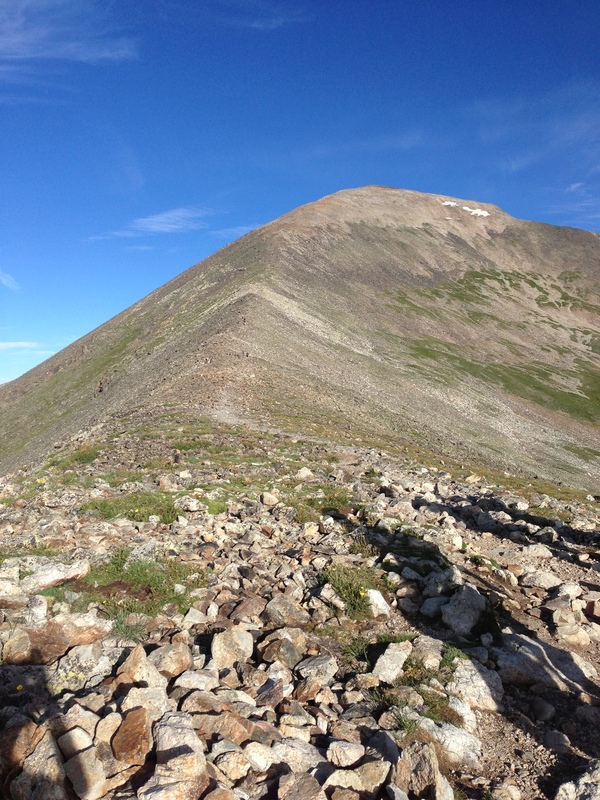 Previous Post The Rockies: Another Weekend…Another Fourteener…Mt. Bierstadt! Good grief Beth… you must be in excellent shape. I live at 7,000 ft and I get winded pretty easily (of course I am 70 yrs old). I wonder how mama goat finds papa goat… I guess she has a one-night stand! I love running into mountain goats! Great pictures and awesome story.